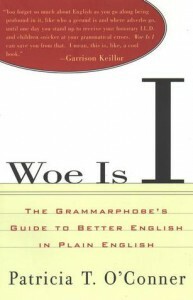 Woe is I: The Grammarphobe’s Guide to Better English in Plain English, Patricia T. O’Conner, Grosset/Putnam, 1996, ISBN 0-399-14196-0, 227pp. I commented to my “Teaching of Writing” professor that I felt somewhat unarmed in the battle of grammar, having learned to trust my instincts in my past writing, but not necessarily able to define the terms and instruct people in their usage. She recommended this book as an aide. I recommend it to you. The best part of this book is Chapter 9, “The Living Dead,” which talks about grammar “rules” that people have mistakenly assumed as valid. This includes splitting an infinitive, a holdover from the 1800s when a pedant decided that English should follow the Latin in this area. Nevermind that the words “to love” and “amare” are entirely different in the two languages (the infinitive is the “to” in front of the verb–in Latin, it is impossible to separate this, while in English it is often left out entirely). Another “rule” is that you should not end a sentence with a preposition, for the mistaken assumption that all prepositions must be followed by their object. However, one item that she calls a dead rule is still being contested, I think, and that is “data” as a singular or plural noun. In common usage, data has become a synonym for information, but in scientific literature, data is still the plural of datum. The scientists will probably lose out on this one, but I wouldn’t use data as a singular in an important paper. The examples are witty and O’Conner makes a fairly dry subject even readable. I don’t think I’d want to make a regular meal of this type of book, but a little roughage every now and then is good for the system.